Everyone knows that 2015 is the year that Marty McFly and Doc Brown journey to in Back to the Future Part II. While we may not have hoverboards or Jaws 19, we are getting a new 30th anniversary Blu-ray and DVD release of the Back to the Future trilogy, which isn’t a bad consolation prize. In fact, the slightly more obsessive fans have even more reason to celebrate, as the Back to the Future animated series from the early ‘90s is coming to DVD for the first time. The 30th anniversary box set will be released on October 20, 2015, approximately one day before Marty actually travelled into the future. However, fans hoping to celebrate October 21, 2015 properly should know that the original trilogy will return to theaters that day, letting you celebrate the occasion twice over. If you live and breathe these movies, make sure you clear your schedule this Fall. You’re going to be busy. Experience the future all over again with the “Back to the Future 30th Anniversary Trilogy”! Join Marty McFly (Michael J. Fox), Doc Brown (Christopher Lloyd) and a time traveling DeLorean for the adventure of a lifetime as they travel to the past, present and future, setting off a time-shattering chain reaction that disrupts the space time continuum! From filmmakers Steven Spielberg, Robert Zemeckis and Bob Gale, this unforgettable collection features hours of bonus features and is an unrivaled trilogy that stands the test of time. - Looking Back to the Future: A 9-part retrospective documentary from 2009 on the trilogy’s legacy. - Back to the Future: The Animated Series: 2 episodes (“Brothers” and “Mac the Black”) from the 1991 series featuring live action segments with Christopher Lloyd as Doc Brown. It’s about time! The adventures continue with all 26 episodes of the award winning “Back to the Future: The Complete Animated Series,” in its entirety and uncut! Join Marty McFly and Doc Brown, Doc’s wife Clara, sons Jules and Verne, and dog Einstein for more hilarious escapades as they time travel to Prehistoric Hill Valley, Ancient Rome, Medieval England, the Civil War, the days of the pirates, the far future and beyond. 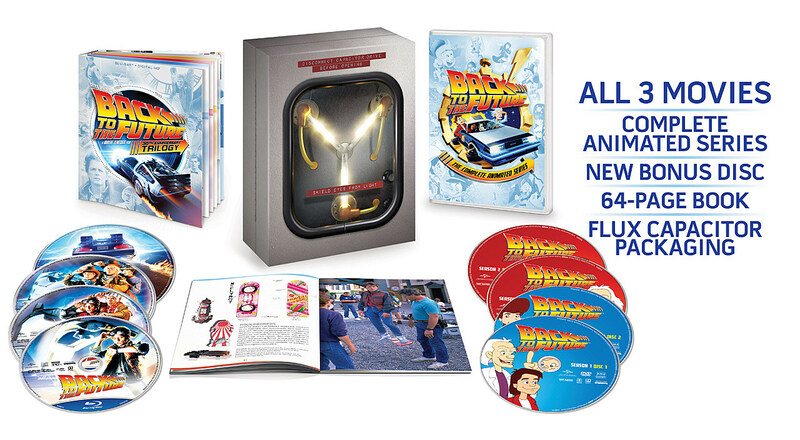 Featuring live action segments with Christopher Lloyd as Doc Brown, science experiments by Bill Nye the Science Guy and the vocal talents of Mary Steenburgen (Clara), Thomas Wilson (Biff) and Dan Castellaneta (Doc), it is family entertainment at its best and a true treasure for all Back to the Future fans! - Drawn to the Future: New interview with creator/writer Bob Gale and writer John Ludin. - Galleries: Rare archival materials featuring character art, DeLorean designs and more. Great Scott! For the first time ever, “Back to the Future: The Complete Adventures” pairs together the original beloved trilogy starring Michael J. Fox and Christopher Lloyd along with the complete TV series. Join Marty McFly, Doc Brown and a time traveling DeLorean for the adventure of a lifetime as they travel to the past, present and future, setting off a time-shattering chain reaction that disrupts the space time continuum. You can check out the box art or all three sets in the image below.